(CNN)North Korea fired two missiles Wednesday morning from its eastern coast, according to South Korean and U.S. officials. Both are believed to be Musudan intermediate-range missiles, fired from the North Korean port city of Wonsan, said Commander Dave Benham, spokesman for the U.S. Pacific Command. North Korea has made at least four previous attempts this year to test this type of missile. Both missiles were tracked over the Sea of Japan, also known as the East Sea, "where initial indications are they fell," Benham said. Benham said the missile launches did not pose a threat to North America. Japan's defense minister Gen Nakatani told reporters that the first missile launch did not affect the country's security, but he also called for immediate meetings to take all possible measures to protect Japan. He made the comments before the second missile launch. The first missile launch occurred at 5:58 a.m. local time and the South Korean military presumed that one had been a failure, according to a spokesperson from the country's Joint Chiefs of Staff. About two hours later, North Korea fired the second missile at 8:05 a.m. local time, according to the spokesperson. That missile flew about 150 kilometers, a South Korean military official told CNN, but he could not say where it fell. He said further analysis is being conducted. The U.S. State Department condemned the recent missile tests in a statement: "We are aware of reports that the DPRK fired two ballistic missiles. We are monitoring and continuing to assess the situation in close coordination with our regional allies and partners." The United States advised North Korea to stop its ballistic missile tests and said it only strengthened the international community's resolve to press forward with U.N. sanctions. The United States said it would also defend its allies, South Korea and Japan, and called its commitment to them "ironclad." "We remain prepared to defend ourselves and our allies from any attack or provocation," according to U.S. State Department spokesperson John Kirby. This year, North Korea has taken much interest in the Musudan, an intermediate-range missile with a strike range of 3,000 to 5,500 kilometers (1,864 to 3,417 miles). North Korea attempted its fourth Musudan test in May, but it exploded after flying for about two to three seconds, according to U.S. defense officials. In late April, a twin missile test of Musudan missiles also failed. In mid-April, on the anniversary of North Korea's founder Kim Il Sung's birthday, another reported Musudan missile launch ended in failure. All launches were from the North Korean port city of Wonsan. The Musudan missile isn't really new, according to John Schilling, an aerospace engineer who regularly contributes to 38 North, a North Korean monitoring project. "It showed up in North Korea over a decade ago, and it seems to be based on a 1960s-era Soviet design with some local modifications." The Musudan with its intermediate-range capabilities could deliver a nuclear warhead as far as the U.S. base in Guam, he wrote in an opinion piece for CNN. The last several months have been particularly contentious on the Korean peninsula, after North Korea claimed to have tested its first hydrogen bomb, an assertion that U.S. officials dispute, and fired a satellite into orbit. Why so many missile tests? North Korea could be testing missiles with such intensity this year due to more financial challenges, said Stephan Haggard, director of the Korea-Pacific program at the University of California San Diego. Pyongyang has been hit with new U.N. sanctions, a crackdown to block North Korea from the international financial system and the closure of the joint North-South Korea Kaesong complex this year. "North Korea is on the verge of feeling quite substantial economic distress," Haggard said. "Part of the effort here is to get attention focused back on North Korea, so that perhaps they think they can get some relief from the sanctions instituted recently." North Korea wants to develop its missiles, because it's a way of delivering nuclear weapons, he said. "You can develop a nuclear device, but unless you can deliver it, it has no strategic value," he said. Without an air force or a technically capable submarine, the missiles are the only route. Haggard says nuclear weapons give North Korea's Kim Jung Un leverage to bargain with the rest of the world. "The farther along they are, the higher bribe price the external community has to pay for them to give it up," he said. Kim has been in a rush to sharpen North Korea's nuclear and missile capabilities, more so than his father. 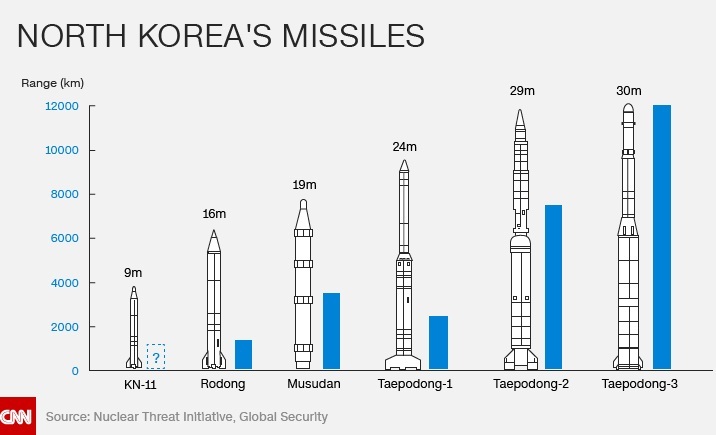 In an interview with CNN's Paula Hancocks earlier this month, South Korean Defense Minister Han Minkoo pointed out that during the 18 years of Kim Jung Il's reign in North Korea, the country had conducted 18 missile tests. In just four years of reign under his son, the younger Kim has now overseen 27 missile launches with the two most recent tests on Wednesday. 0 Response to "North Korea fires two missiles, South Korea says"